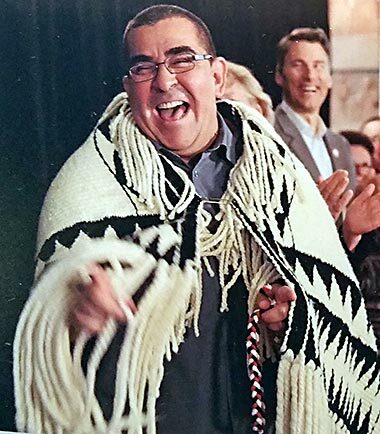 For those of you interested in knowing more about First Nations Aboriginal Tourism, there is no better place on the planet to explore this rich cultural adventure than in Vancouver, B.C. Herewith, a mere glimpse of what you might discover in and around this beautiful city. 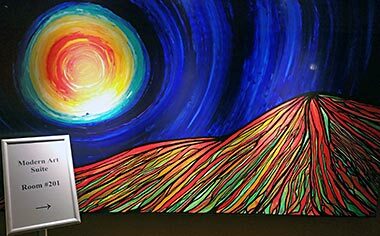 featuring original Aboriginal art. 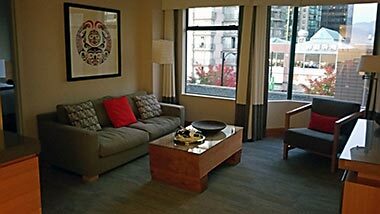 This suite overlooks Robson Street. 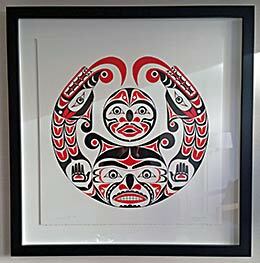 Original Aboriginal art print in one of The Listel’s First Nations suites. Modern and abstract art is on view all through the Listel as well. 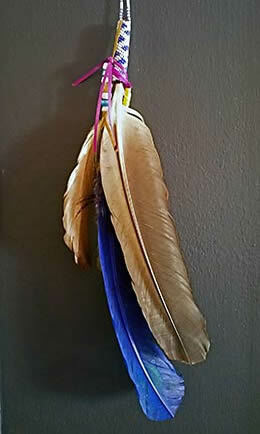 The hallway also displays native pieces with attribution to UBC’s Museum of Anthropology. 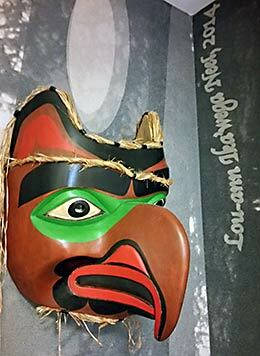 Original Aboriginal mask on the wall of one of The Listel’s First Nations suites. 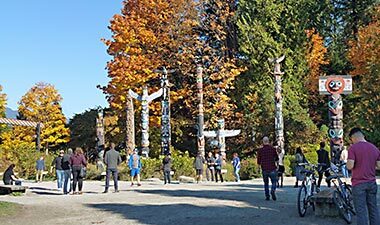 Any visit to Vancouver for an Aboriginal touristique quest absolutely must include the treasured Museum of Anthropology at the University of British Columbia. 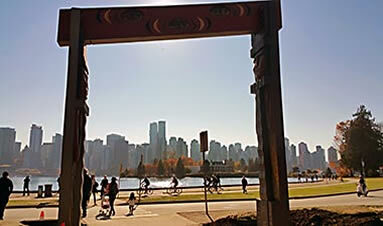 The entire campus is built on ancestral land of the Musqueam people, the People of the River Grass. 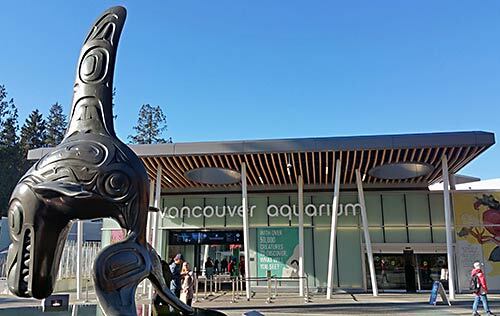 The MOA honors this sacred location with a welcoming stone at the entrance written in the Musqueam language. Dr. Jennifer Kramer, Curator, Pacific Northwest Art, told us “It is an honor to inhabit and share this sacred place.” In 1976, four Gixsan carvers produced the massive red cedar wooden front door panels which used to be on the front doors of MOA, and are now protected from the elements, located inside at the entrance to the MOA shop. 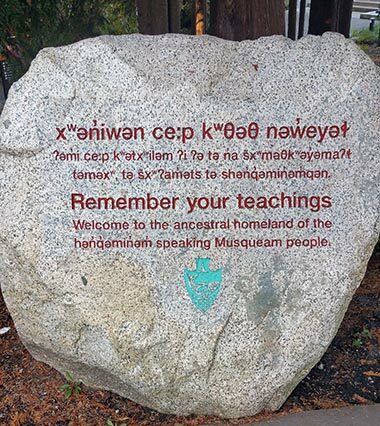 Welcome stone in Musqueam language and in English. 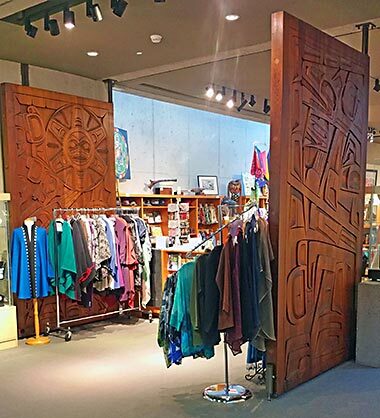 Gixsan artist-carved entrance doors, now located inside at the MOA gift shop entrance. 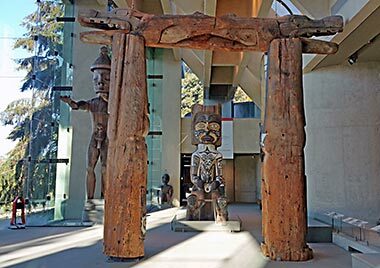 MOA houses one of the world’s finest collections of Northwest Coast First People’s art in an award-winning building designed by Canadian architect Arthur Erickson. Opened in 1976, the concrete and glass structure is based on the post-and-beam structures of northern Northwest Coast First Nations. 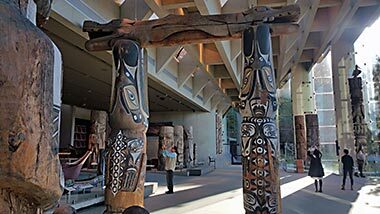 MOA’s Great Hall displays huge totem poles, feast dishes, and canoes from the Kwakwaka’wakw, Nisga’a, Gitxsan, Haida, and Coast Salish peoples. 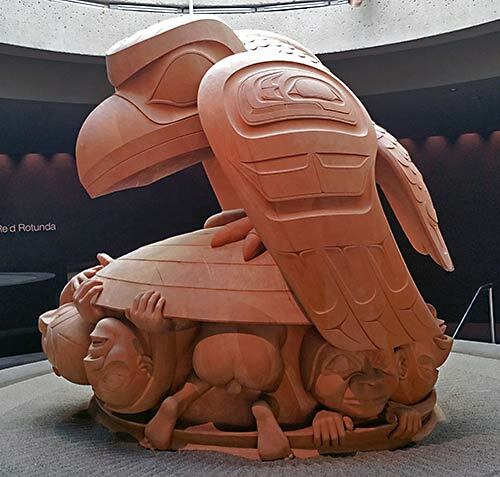 MOA also has the world’s largest collection of works by Haida artist Bill Reid, a gallery devoted to a collection of European ceramics unique to North America, and a series of innovative Multiversity Galleries showcasing MOA’s world-wide research collections. To visit MOA’s website, click here. all the way around it. This side view is rarely photographed. 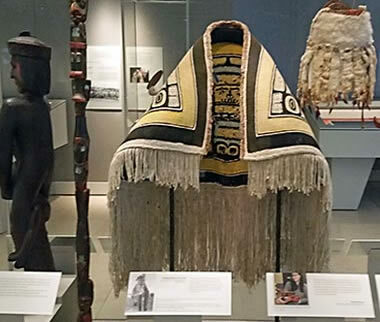 MOA’s recently opened Gallery of Northwest Coast Masterworks showcases historical and contemporary Indigenous art from the region. 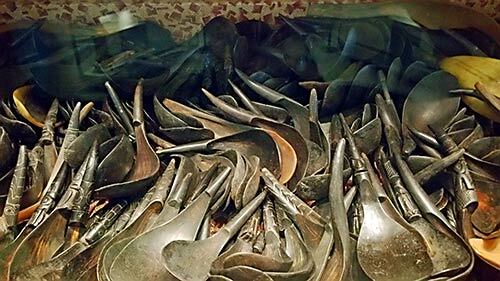 It opened on National Aboriginal Day, June 21, 2017.
collections such as these artfully carved ceremonial spoons. 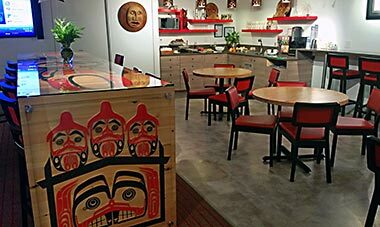 Centrally located in Vancouver’s historic Gastown district at 29/31 West Pender, the Skwachays Lodge exterior features a totem pole and First Nations art on the top floor. 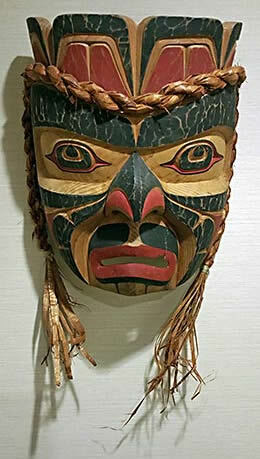 Skwachays Native mask hangs in one of the suites. 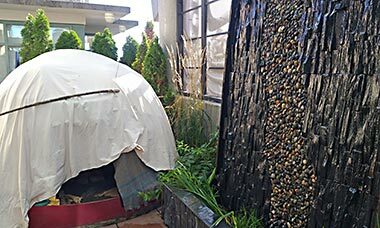 Smudge room on the top floor exterior patio available to guests. 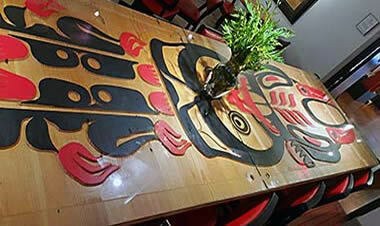 Central in the lounge space of the Kayachtn Room, is local artist Eric Parnell’s hand-crafted communal totem table. 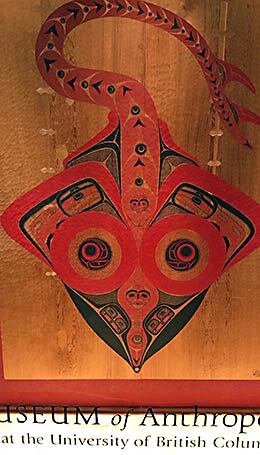 The façade of the table greets guests with the image of the Three Watchmen standing atop the Beaver House. 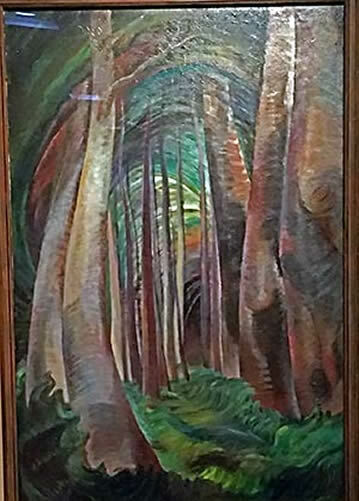 Emily Carr during the time she was painting in the Victoria/Vancouver areas. Influenced by Lawren Harris and Mark Tobey, Carr unified natural and spiritual elements into a 1930s-syle reflective of modernist art in Canada and the West Coast. Raised in 2009, this pole was carved by many hands to honor Rose Cole Yelton, her family and all those who lived in Stanley Park. 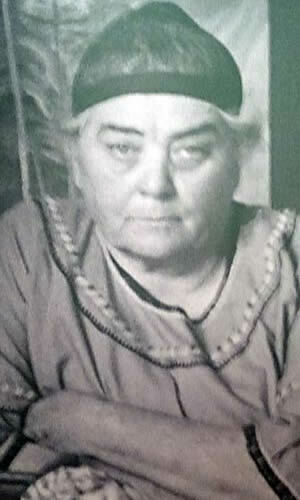 Until she died in 2002, Rose was the last surviving member of the park’s Brockton Community of First Nation people living on Brockton Point. 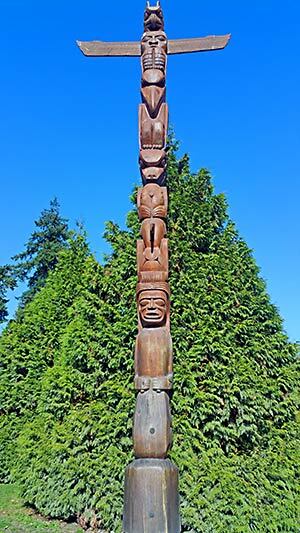 Many tourists visit this totem park to explore the legends and traditions of the coastal people. From the totem pole garden in Stanley Park, the vista of the Vancouver skyline is spectacular, at any time of day or night. Orca statue, Chief of the Undersea World, in front of the Vancouver Aquarium, was designed by Bill Reid. “We create memories here,” said Inez Cook, owner of Salmon n’ Bannock. Her restaurant on West Broadway opened in 2010 and specializes in bannock bread with cedar jelly and Indian candy made from wild salmon, also organic meat and game. Her customers comprise a mix of visitors from all corners of the world who come for the native culinary experience but also to enjoy her company. She has traveled all over the world for 28 years as a flight attendant and it seems that everyone who is anyone knows her and knows about Salmon n’ Bannock. The day we visited she told us that David Suzuki, well-known Canadian science broadcaster, had dinner reservations for that evening. Reservations are definitely a must. Inez, a charismatic woman with a charming warmth, has her own story of overcoming. “I was one of the ones who was taken away.” She is one of three women in the documentary filmmaker Azra Rashid’s “Her Own Money - Working Title,” to be released in June, 2018; in the meantime, check out the film's Facebook page. Salmon n’ Bannock honors First Nations foods like bannock bread with cedar jelly and Indian candy made from wild salmon. 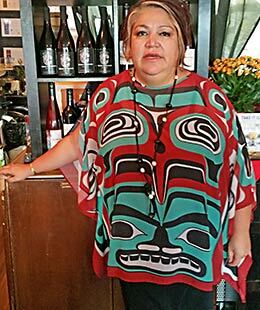 Inez Cook, owner, Salmon n’ Bannock. You can find her most evenings at her popular First Nations restaurant. 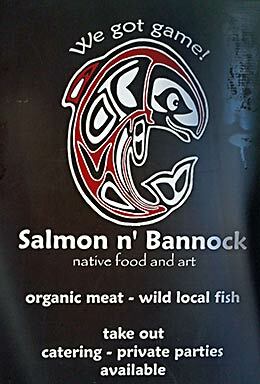 Salmon n’ Bannock displays Native art throughout the restaurant.